norabt wrote: It sounds like everything is correct. If this were a true "hand load jackpot", then the machine wouldn't load any coins into it, correct, or would the machine still load coins into it but give me the option to manually load coins into it, from the front of the machine? Just to add some additional information here on the Front Jackpot, the style that has the Reserve Jackpot included, here are some pictures kind of explaining the operation that occurs between the mechanism and the Front Jackpot! The Front Jackpot operation can be a little confusing and I hope this helps! Usually, in my opinion, the Hand Fill Option was not used in conjunction with a Reserve Jackpot! I hope these pictures help somewhat as if the Front Jackpot is not tripping I think it would be in the areas shown! MONTI wrote: Just to add some additional information here on the Front Jackpot, the style that has the Reserve Jackpot included, here are some pictures kind of explaining the operation that occurs between the mechanism and the Front Jackpot! Thanks for the pics. I'm attaching pics of what I have... I removed the mechanism and by pushing or moving some levers on the jackpot, I got it to dump the coins, but in looking at your pictures vs mine, it looks like mine may be broken or missing something. Can you give me any info? Your jackpot is correct for a hand load jackpot. The reserve jackpot parts are missing as they should be. You don't need a reserve jackpot as it is a hand load jackpot. When a jackpot is hit, it must be manually reloaded with coins. 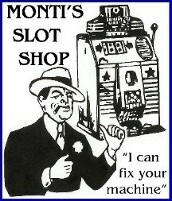 norabt wrote: Your jackpot is correct for a hand load jackpot. The reserve jackpot parts are missing as they should be. You don't need a reserve jackpot as it is a hand load jackpot. When a jackpot is hit, it must be manually reloaded with coins. The jackpot in this machine does load with coins periodically as I put nickels in it, which I thought was odd. The other thing that I'm not 100% sure of is that I did hit the jackpot earlier today- the machine dispensed 20 nickels, as it should, but didn't release the jackpot coins. That is what I'm trying to figure out now. Yes, you do have the proper Front Jackpot for a hand fill slot machine as was mentioned above, sorry for confusing you with the other pictures above as I mistakenly thought a Reserve Jackpot was mentioned! On your Front Jackpot you do have the trip lever which releases the main jackpot flap as you said you did by hand and you also have the jackpot flap reset as shown in the picture of your jackpot that I added information to! 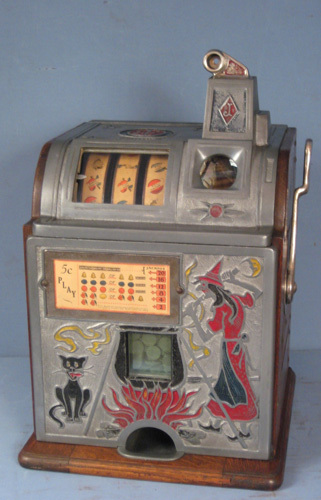 And on the mechanism you do have the "Tab" or "Knob" on the top payout slide, the two pay slide that when a Jackpot is hit slides backwards and should trip the Front Jackpot trip lever pushing it up! Then on the next handle pull when the slides come forward and refill either the slides coming forward or the lever I marked as the Jackpot Reset Lever should make contact with the Reset Lever on the Front Jackpot pushing it forward to re-latch the Trip lever! As this is not occurring you have a "hand shake" problem between the mechanism and the front jackpot! Different issues can cause this, possibly with a pin point LED flashlight you can look thru the lower part of the mechanism thru to the levers in question that are in the pictures while the slot machine is assembled! Proper alignment of the levers mentioned as to horizontal and vertical positioning are critical for the operation to work properly. Also, the base plate the mechanism sits on may be back to far for the front jackpot to reset as well! I know this sounds complicated and for a first time slot machine enthusiasts it is a little hard to understand! Sorry but without having hands on with an issue like this it is rather hard to walk you thru correcting it! Possibly someone else can explain it better than I am!